CORPUS CHRISTI - Veterans Memorial embarks upon its fourth season of play with four players selected to the 2019 South Texas Preseason Large School Baseball All-Star Team. The honor squad, authored by the 14 area Class 5A coaches, will be recognized at the 15th annual South Texas Winter Baseball Banquet, scheduled for Thursday, January 24 at the Omni Hotel in downtown Corpus Christi. Senior pitcher JoJo Villareal, a 2018 first-team all-state selection by the Texas High School Baseball Coaches Association, helped power the Eagles to 33-7-1 record and a trip to the state tournament in Round Rock last season. Villareal won 12 games and posted a 2.64 ERA, striking out 78 in 88.2 innings pitched. His backstop, MJ Rodriguez, slugged 12 extra base hits, plated 20 runs, and coaxed 47 free passes as a sophomore a year ago. The Corpus Christi Caller-Times named Rodriguez, a repeat preseason selection, to the All-South Texas second unit. First baseman Daylan Pena is coming off an impressive freshman campaign in which he hit .458 with 12 doubles, seven home runs, 52 RBIs, and 32 runs scored. Pena was the All-South Texas Newcomer of the Year and second team all-state by THSBCA. Completing the Eagles contingent is junior outfielder and Texas A&M commit Kobe Andrade, who was an honorable mention on the 30-5A South Zone All-District Team last season. The King Mustangs and Tuloso-Midway Warriors each account for three players on the preseason honor squad. King's Jon Barrera and Jacob Garza were both honored at last year's banquet. Barrera went 11-3 on the hill and carved out a 0.79 ERA in 2018. The ace southpaw and Texas Tech commit struck out 114 against 23 walks over 62.1 frames en route to first-team All-South Texas honors. Garza was the 30-5A South Zone Utility Player of the Year while then-junior Andrew Delgadillo captured zone MVP honors. T-M senior Ray Rodriguez is a member of the preseason all-stars' pitching staff. Rodriguez completed two of his nine starts and was named to the North Zone second team last season. Shortstop Ben Hovda was a zone first-teamer, batting .368 with 36 runs scored and 22 RBIs. Outfielder Darren Mourer, also a first-team zone selection, notched 25 runs and 25 RBIs while reaching base at a .392 clip. Carroll boasts two players on the squad, senior third baseman Ramsey Villarreal and senior outfielder Tyler Sanchez-Lozano. Villarreal garnered an honorable mention on the 30-5A all-district listings a year ago. Junior Isaac Flores of Ray and Callen senior Hambleton Oliver round out the pitching staff. 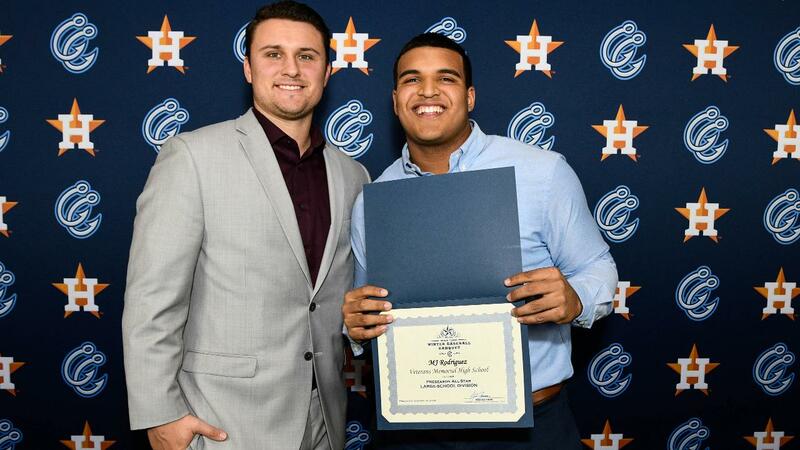 In 2018, Flores was third team All-South Texas and a 30-5A North Zone first-team pick. Oliver achieved zone pitcher-of-the-year honors and was tabbed second team all-state by THSBCA. The Baylor bound right-hander posted a 10-3 record and 0.75 ERA, finishing prominently on the area leaderboard with 125 strikeouts. Second baseman Ryan Stark was first team 30-5A North Zone for Gregory Portland last season. As a junior, Stark batted .344 with a .404 on-base average and was 6-for-7 in steal attempts. He recently signed a letter of intent to play at Missouri Valley College. The Large School Baseball All-Stars are among the 60 high school student-athletes who will be recognized at this year's South Texas Winter Baseball Banquet. Tickets, priced at $55, are on sale now at the Whataburger Field Box Office and via phone at 361-561-HOOK (4665).